Tickets may be purchased at the service windows on the patio to the miniature golf courses. To pre-order tickets or make arrangements for birthday parties or group outings, please call (520) 296-2366 ext. 13, or visit our Groups & Parties page to make reservations online. 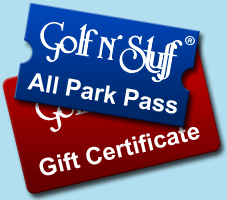 2 Hours Unlimited Use of Miniature Golf, Bumper Boats, Go-Karts, Laser Tag, plus 4 Arcade Tokens!